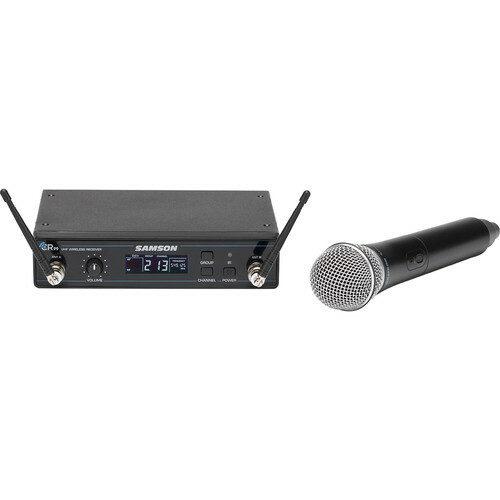 The Concert 99 Handheld Frequency-Agile UHF Wireless System from Samson is an ideal solution for the active performer who needs a reliable, great-sounding system for wireless applications. It can be used to capture audio for presenters, educators, house of worship speakers, fitness instructors, and others in search of wireless freedom. Featuring a large backlit LCD display, simple operation with auto-scan channel selection, and infrared set for syncing the transmitter and receiver channel, the Concert 99 is simple-to-use and operate. It delivers clear, interruption-free performance, and utilizes true RF diversity with pilot tone-key and auto-mute functions. Furthermore, the Concert 99 comes in four configurations. The vocal handheld system includes the CH99 handheld transmitter with Samson's Q8 dynamic microphone capsule. The CB99 belt pack system can be configured with either the SE10 earset microphone, LM10 lavalier microphone, or a 1/4" instrument cable. In addition, the Concert 99 includes a standard 19" rackmount kit for permanent installations or transporting in a mobile rack. Box Dimensions (LxWxH) 14.803 x 11.575 x 3.386"